A ketogenic diet is one that is very low in carbohydrate and high in fat, with moderate protein. Such a diet shifts the body into an ultra-efficient metabolic state in which fat is utilized as the primary source of fuel in place of glucose. This metabolic state, known as nutritional ketosis, has a pronounced therapeutic effect on the body. The diet has proven safe and effective in helping people lose excess weight, improve mental function, balance blood sugar and pressure, improve cholesterol levels, and much more. 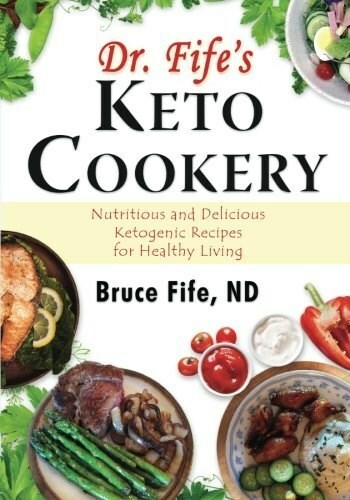 Described as the ultimate ketogenic cookbook, Dr. Bruce Fife has compiled into one volume his favorite ketogenic recipes, nearly 450 in all! It includes 70 vegetable recipes, 47 salads and 22 dressings, 60 egg recipes, 50 delicious high-fat sauces for meats and vegetables, as well as a variety of mouthwatering wraps, soups, and casseroles, with a creative array of meat, fish, and poultry dishes. With this resource, you will always have plenty of options to choose from for your daily needs. No exotic or hard-to-find ingredients here. This is a practical cookbook that can be used every day for life. All of the recipes are simple, with ingredients that are readily available at your local grocery store. None of the recipes include any artificial sweeteners, sugars, flavor enhancers, gluten, grains, or other questionable ingredients. Recipes use only fresh, wholesome, natural foods to guarantee optimal health.